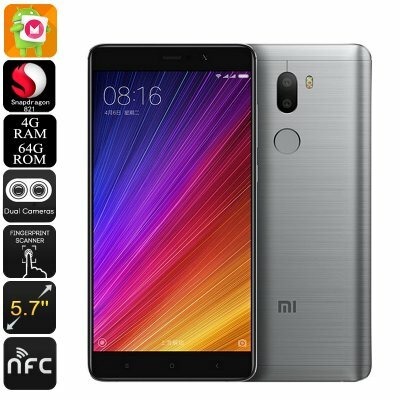 Successfully Added HK Warehouse Xiaomi Mi 5S Plus Android Smartphone - Android 6.0, Quad-Core CPU, 4GB RAM, Dual-IMEI, 4G, 13MP Cam (Gray) to your Shopping Cart. With the Xiaomi Mi 5S Plus, you will be guaranteed to undergo a high-end user experience that treats you with all the latest features the mobile industry has to offer. Running on the MUI 8 Operating System, this Android smartphone comes packed with all the regular Android 6.0 features along with an abundance of its own personalization options – allowing you to fully customize your mobile experience to your own liking. Play games, watch movies, browse the web, and use the latest Android applications – no matter what you throw at this beautiful Chinese smartphone, it will be handled with ease. Along with its powerful 3700mAh battery, the Xiaomi Mi 5X Plus lets you enjoy all its features for countless hours in a row, taking away your fear of ever running out of power again. With 64GB of internal memory, this Android phone packs enough storage for you to save all your favorite media and files. Head out to the Play Store and download the latest forms of mobile entertainment. Along with its 5.7-Inch Full-HD display that provides you with stunning visuals – you will be able to enjoy all your media to its absolute most. A top notch and ultra-fast fingerprint scanner that has been placed at the back of the smartphone does not only provide first-class security but also lets you access your phone in a split second. No longer will there be the need to remember difficult passwords or unlocking patterns as this Xiaomi smartphone can be unlocked with the touch of a finger. Thanks to 64-bit Qualcomm Snapdragon 812 CPU, this Android smartphone packs some real power through which it allows you to enjoy the latest games and most demanding applications without dropping a frame. This powerful Quad-Core CPU that has been clocked at 2.35GHz has been built to deliver a powerful yet energy efficient performance, letting you enjoy your favorite media for hours in a row without draining the phone’s massive battery. Besides its state of the art processor, this Chinese Android phone furthermore packs a mesmerizing 4GB of RAM, making this Xioami smartphone perfect to meet all your multitasking demands. Featuring Dual-IMEI numbers and 4G connectivity, the Xiaomi Mi 5X Android smartphone provides you with lightning fast internet connection on the go. No matter where you’re at, with this 4G smartphone at your side, you’ll always be able to browse the web, stream movies, and download files in the blink of an eye. This Chinese smartphone furthermore supports Dual-Band WiFi, letting you enjoy the fastest available data speeds whenever wireless internet is available. No matter where life takes you next, with this high-end Android phone in your pocket you’ll always be able to stay connected to your friends, family, and loved ones back home.